As the public becomes increasingly worried by climate change and deforestation, Dr. Seuss’s The Lorax, originally published in 1971, may be more relevant than ever before. With its unforgettable characters and sentiment, the classic is an entertaining and informative way of introducing young children to environmental issues. 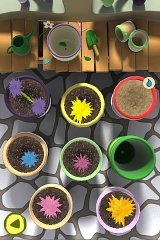 Unfortunately, The Lorax Garden app (Oceanhouse Media, April 2010) pales in comparison. The aim of the app is to restore barren forests by digitally raising flowers and Truffula trees. The process of doing so is unnecessarily complicated and seems to involve more steps than growing an actual tree. First, you must choose one of five locations, each with a forest in need of a facelift. To be successfully revived, every forest needs a different amount of full-grown Truffulas, ranging from three to nine. In the world of The Lorax Garden, raising a Truffula tree requires a combination of “care hearts,” water, and time. When you enter a new location, you receive ten care hearts, but they run out quickly. Though the needed number varies, it can take more than half of your allotted care hearts to raise one full-grown Truffula tree. To get more care hearts, you must grow one of six varieties of flowers, requiring water, pollination, and weeding — all in under a minute, as the section is timed. Growing each type of flower differs in difficulty and in how many care hearts you earn. Here’s what I know for sure: reviving one of the forests in The Lorax Garden is a fairly significant investment of time. Add the time it takes to grow flowers to that required to grow a Truffula tree and you’re looking at well over an hour to restore a forest of nine Truffulas. But don’t worry: you probably won’t finish. Unless you’re one of those people who have to finish what they’ve started, you’ll be frustrated and/or terribly bored after growing just one or two Truffula trees. And if The Lorax Garden can’t hold the attention of a book- and garden-loving adult like myself, it surely won’t be a pleasant experience for children. So do yourself and your children a favor. Forgo The Lorax Garden app. Read the picture book with your kids and use the $1.99 the app would have cost to buy a sapling or some seeds — real ones, not the pixelated kind brought to you by the Apple device of your choice. Plant them in your yard and bring The Lorax to life. Dr. Seuss would have preferred it that way. Available for iPhone, iPad, and iPod touch (requires iOS 4.2 or later); $1.99. For preschool and primary users. Laura Marenghi is a former editorial intern at The Horn Book, Inc.